As Christians, we are all called to priestly and prophetic mission to share and proclaim the Gospel. strive towards holiness through Mary and the Dominican Spirituality. chambers of our hearts to Your open arms of forgiveness. Amen. When the Sabbath was over, Mary Magdalene, Mary, the mother of James, and Salome bought spices so that they might go and anoint him. Very early when the sun had risen, on the first day of the week, they came to the tomb. They were saying to one another, “Who will roll back the stone for us from the entrance to the tomb?” When they looked up, they saw that the stone had been rolled back; it was very large. On entering the tomb they saw a young man sitting on the right side, clothed in a white robe, and they were utterly amazed. He said to them, “Do not be amazed! You seek Jesus of Nazareth, the crucified. He has been raised; he is not here. Behold, the place where they laid him. But go and tell his disciples and Peter, ‘He is going before you to Galilee; there you will see him, as he told you.’ ”Then they went out and fled from the tomb, seized with trembling and bewilderment. They said nothing to anyone, for they were afraid. The Appearance to Mary Magdalene. The Appearance to Two Disciples. Spiritual Work: Pray day three of the Divine Mercy chaplet. Lay all fruits of your Lenten journey before our Blessed Mother to use as she sees fit for the greater glory of God. Celebrate the Resurrection. Now on the occasion of the feast he used to release to them one prisoner whom they requested. A man called Barabbas was then in prison along with the rebels who had committed murder in a rebellion. The crowd came forward and began to ask him to do for them as he was accustomed. Pilate answered, “Do you want me to release to you the king of the Jews?” For he knew that it was out of envy that the chief priests had handed him over. But the chief priests stirred up the crowd to have him release Barabbas for them instead. Pilate again said to them in reply, “Then what [do you want] me to do with [the man you call] the king of the Jews?” They shouted again, “Crucify him.” Pilate said to them, “Why? What evil has he done?” They only shouted the louder, “Crucify him.” So Pilate, wishing to satisfy the crowd, released Barabbas to them and, after he had Jesus scourged, handed him over to be crucified. 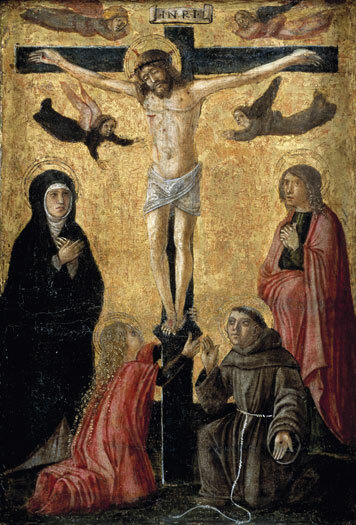 The Crucifixion. They brought him to the place of Golgotha (which is translated Place of the Skull). They gave him wine drugged with myrrh, but he did not take it. Then they crucified him and divided his garments by casting lots for them to see what each should take. It was nine o’clock in the morning when they crucified him. The inscription of the charge against him read, “The King of the Jews.” With him they crucified two revolutionaries, one on his right and one on his left. Those passing by reviled him, shaking their heads and saying, “Aha! You who would destroy the temple and rebuild it in three days, save yourself by coming down from the cross.” Likewise the chief priests, with the scribes, mocked him among themselves and said, “He saved others; he cannot save himself. Let the Messiah, the King of Israel, come down now from the cross that we may see and believe.” Those who were crucified with him also kept abusing him. Spiritual Work: Turn off all music, TV, and social media distractions starting at noon. At the mercy hour, 3 p.m. start the Divine Mercy Novena. On the first day of the Feast of Unleavened Bread, when they sacrificed the Passover lamb, his disciples said to him, “Where do you want us to go and prepare for you to eat the Passover?” He sent two of his disciples and said to them, “Go into the city and a man will meet you, carrying a jar of water. Follow him. Wherever he enters, say to the master of the house, ‘The Teacher says, “Where is my guest room where I may eat the Passover with my disciples?”’ Then he will show you a large upper room furnished and ready. Make the preparations for us there.” The disciples then went off, entered the city, and found it just as he had told them; and they prepared the Passover. Disclaimer: We hope that you enjoy the content of this website. We are all journeyers on the road toward heaven and these are some of our thoughts and ideas. None of us is a religious expert; we hope not to make any egregious errors, and we will try to be as accurate as possible.